We reviewed the Solo 2 3D and the Chroma Player BD. Accessories Included – RF handheld remote control, VESA TV rear mounting kit. Video – HDTV Source & Scales up to 1080p. HDMI 3D, DVI-I and VGA Interfaces. Optional Component Video (CV) with Blu-ray 2D only. Internal Media Storage – From 2TB to 16TB. Optional 12TB RAID 5 storage. Mozaex architecture takes advantage of both highly reliable, customizable (“modular”) embedded Windows and the open architecture of Windows to support a wide range of media and interfaces that other Linux or Linux derivatives can’t support (i.e. 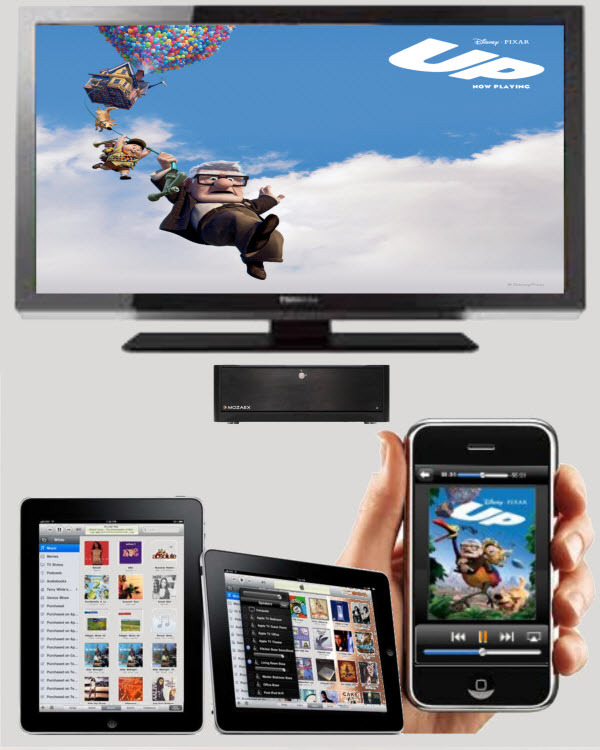 : Blu-ray 3D, USB, iTunes, IE, Opera etc.). Their system architecture is based on “MORE” = Modular + Open + Reliable + Embedded. The products can be distributed or centrally located. 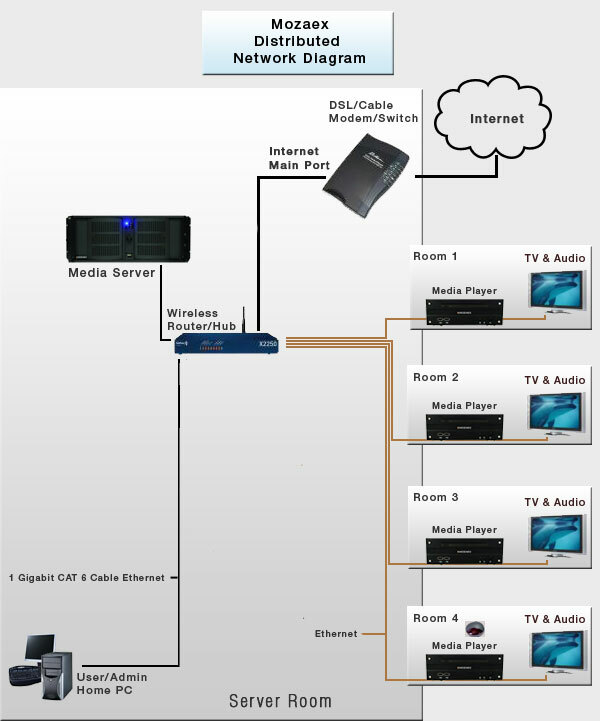 When centrally located, AV switches are used to deliver the content to the respective devices. The devices require local storage (eSATA or USB) and cannot use networks storage such as a file server or NAS. The reason for this is due to the proprietary streaming technology between server and player and the requirements to support a high number of simultaneous Blu-ray streams. 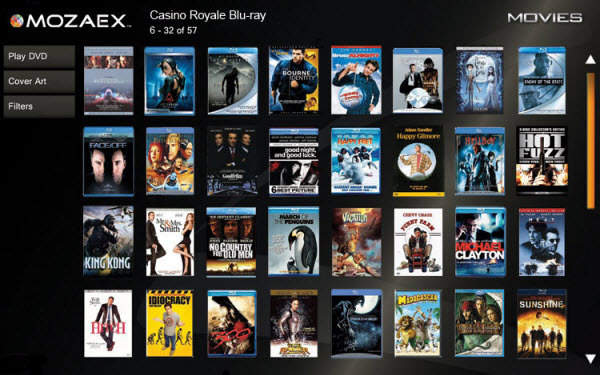 Mozaex top-level server can stream 22 simultaneous Blu-ray streams. Competing products such as Kaleidescape are currently limited to nine. With the low cost of storage today, it costs little extra to have dedicated local storage committed to, and more importantly optimized for, streaming media. As Mozaex products do not ship with the DVD CCA’s or other unlicensed decryption software, it does not breach any contract with the DVD CCA. Unlike Kalaidescape (who are embroiled in a long-running legal battle with the DVD CCA), who use the DVD CCA’s Content Scramble System (CSS) to decrypt and copy DVD and Blu-ray disks, Mozaex does not provide any decryption software. The end-user is free to purchase their own decryption software and install it to make legal backups of content they own. On my trial units I used my Slysoft AnyDVD HD license. Before embarking on the main part of the review, it’s important to point out that the user’s experience and interface will vary depending on the control system in use. (Well over 90% of Mozaex products are connected to systems such as Crestron, AMX, etc.). 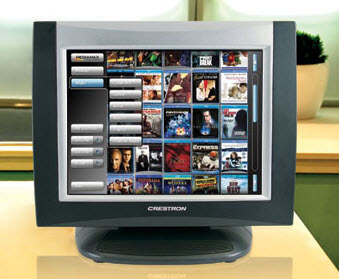 For example, if the control system has a large touch screen, rather than browsing media on the TV, the user will typically browse on the touchscreen. The products are extremely well built. With the front flap closed, the Solo 2 3D is a fairly non-descript black box (that would typically be located in an equipment rack). The Chroma Player BD is fairly compact and cool looking box that ships with an RF remote containing a full keyboard. We won’t discuss installation, as the products are dealer installed, but having seen it, it’s pretty straight forward: connect to Ethernet and enter name of server for remote players, then configure audio and video capabilities of connected devices. In the next 45-60 days things will change. 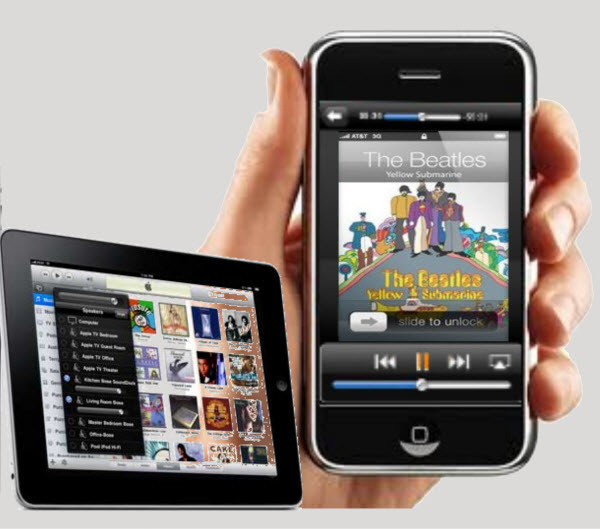 A new feature called iBLU will fully integrate iTunes into the Mozaex user interface. This will allow all metadata and cover art to be retrieved from iTunes and displayed in the native Mozaex user interface. Although the system can be controlled with a simple IR remote, it is more likely to be connected to a home automation system such as Crestron, AMX, Control4, etc. using the systems Application Programming Interface (API). 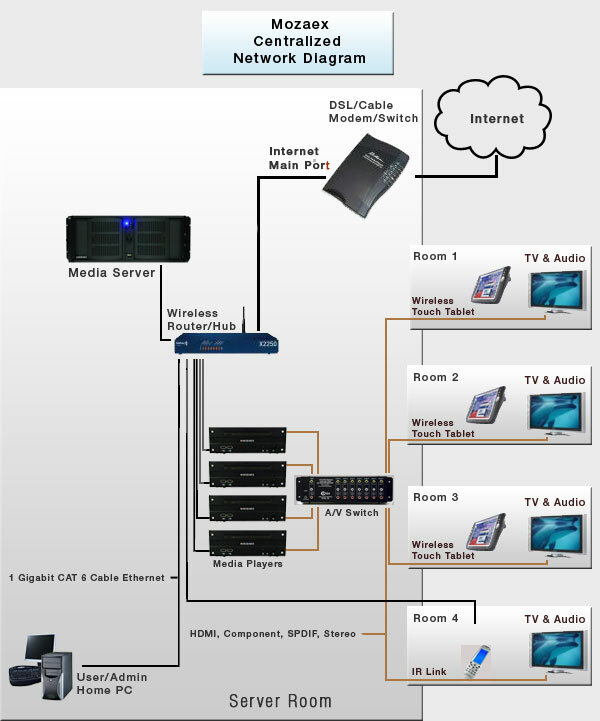 The picture below shows the system being controlled from a Crestron touch panel. Loading movies to the server was simply a case of inserting a disk, clicking “Load” and verifying the meta-data. The system then loads the movie in the background and leaves the user free to watch or listen to other content. As discs are copied rather than ripped, all movies contain all of the extras and original menus of the disc. Although, this does require more disc space compared to ripping to a format such as mkv, it retains the existing quality of the original. With storage being so inexpensive, there’s little reason to rip movies these days (unless it’s for use with portable devices). This does, of course, mean that movies cannot be streamed to mobile devices with Mozaex unless they are ripped somewhere else and then copied to the server. The Chroma player also worked flawlessly. I inserted Blu-ray copy of Mission Impossible 4, and it was loaded and available on the main server about an hour and half later. I connected the player to the network using an unmanaged gigabit switch (as recommended by Mozaex) and streaming content for the main server in the equipment rack worked perfectly – no pauses, no dropped frames or audio drop-outs. No product can please everyone all of the time and I did find a few minor things I wasn’t so enamored with. Again, remember that parts of the user interface and interaction method will vary based on the control system in use. 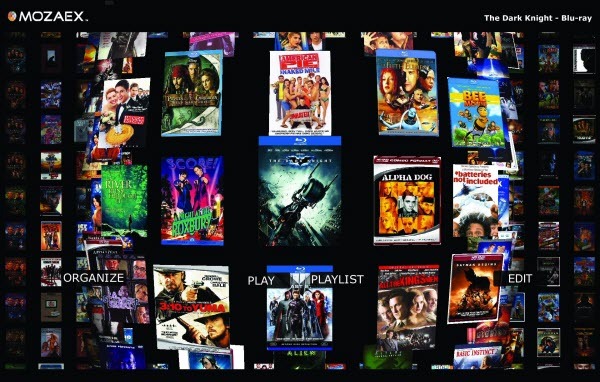 The current movie list and synopsis do display adequate data, but lack a little polish compared to things MediaBrowser in Windows Media Center, which has dozens of themes available and offers the user many choices of how to display their meta-data (including much sought after CoverFlow layouts). On Mozaex, the only layout option the user has for the cover art is the number of rows and columns. The UI is available in 8 languages and can be further modified by Mozaez or an integrator, for those looking for delivery of a truly personalized look and feel. 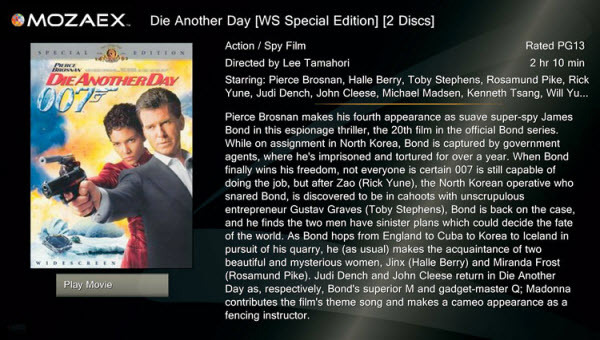 Similarly, many media servers offer a lot of control over the synopsis of the movie. Mozaex only has one option (if using the on-screen display). As the screen shot below shows, there is quite a bit of information that isn’t available, such as aspect ratio, sound format, etc. and there is no rotating, background poster art. Good news, a new version of the user interface (called MOZI) is due next year. (It is already being rolled out for OEM customers.) The screen shot below is a glimpse of what's to come, and it looks like it's certainly improving. Users will be able to add any of the technical data, such as aspect ration, sound format, etc. This uses hardware acceleration, which allows virutally any graphic effect including shadowing, 3D perspectives, dampened movements even gesture control, such as those used on mobile phones. 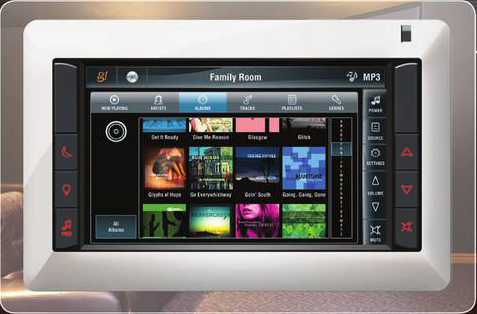 For owners not fortunate to own a control system, the UI can be controlled fully from the supplied infrared remote. In order to make this experience richer, Mozaex is developing apps for both iOS and Android. Submission of the iSO app to the app store is imminent, so it should be available in a few weeks. The Android app will also be available soon. Below are a few preview screenshots from the soon-to-be-released iOS apps. Mozaex provides a nice utility called SurePlay™, which is an online service system ensuring that your Mozaex is fully operating and is running with the latest software updates. It also allows dealers and support staff to perform routine health checkups, update software or respond instantly to a problem via the web all without having to visit your home. I made use of this while reviewing the unit and it worked well. Anyone who’s used a regular Home Theater PC will attest to the fact that there’s quite a bit maintenance required to keep drivers and applications up to date. Mozaex has thought of this and provides a tool called EasyUp. This allows integrators to remotely update software. In addition to the setting supplied by Mozaex, the integrator can also add their own. For example, I used AnyDVD HD to remove the encryption for my Blu-ray and DVD backups. This can be configured to be updated using EasyUp. For those who want, or need, to load additional software, a utility called FlashLoader allows the user to connect a flash drive to the USB port and a list appears of software that can be isntalled with IR by simply selecting it and clicking load. If you’re looking for a high quality, well-engineered media server and distribution system that won’t end up in legal wranglings with the DVD CCA and is a fraction of the cost of Kalaidescape, it’s hard to go wrong with Mozaex. Most importantly, if you need something that will integrate well with a Home Automation or Control System (such as AMX, Control4, Crestron, etc. ), Mozaex provides a rich API for seamless integration. For a full list of models and features, visit the Mozaex web site.